In this second blog post of a series explaining the entire ISV build journey, we focus on step 1: learn and apply. For a comprehensive introduction to the journey, please read the first blog post of this series. Let’s look at the picture above. The first step in the build journey starts with learning about the program options and applying for the program offering of choice (for an explanation about the colors and icons used, please read the introductory blog post). The “Build Better” site on www.sap.com/buildbetter gives all the information that an ISV needs. The information on this site is structured along the same build stages as I outlined in my introductory blog post. 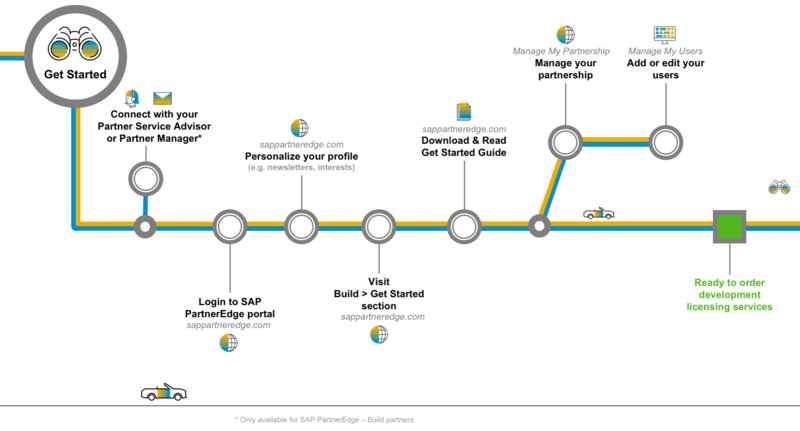 Here, a prospective partner can learn about the benefits of partnering with SAP, and compare the program offerings of full partnership (also known as SAP PartnerEdge – Build), and membership in the Open Ecosystem – Build program. Direct from the Build Better page, an interested ISV can apply for either of the two programs. The “apply now” button goes to the respective application form and the application will be reviewed against the program criteria. For example, the applicant must be a company with a functioning website and a physical office address, and not an individual. In certain countries, a TAX ID number must also be provided. It will take from one to three business days for these checks to be completed. If the admission criteria are not met, the applicant will receive a notification letter via email. For this journey however, we assume the ISV has been accepted into the program. They will receive an email containing a link to a “DocuSign” envelope that enables the ISV to electronically sign the SAP PartnerEdge – Build or Open Ecosystem – Build agreement. As soon as the agreement has been signed, the partner will receive three emails. The first two include their S-user ID and password for accessing the different SAP partner platforms that are available. The third email is a welcome email specific for the Build engagement model or specialization and containing key information on how to get started. With the agreement in place, credentials created and the welcome email in their inbox, the partner is now ready to get started. Let’s move to the next stage: Get Started! This will be covered in next week’s episode. In the next blog post, I’ll cover the Get Started stage. An appetizer is shown below. Stay tuned! Thanks for these nice clear posts and graphics. One thing I would like to see, though: a bit more detail on the criteria for acceptance. Recently 2 Community members (both mentors, both similar profiles ) applied for membership. One got in, one got rejected. What other criteria are there? eg what size, roughly does the organisation be? Are there a lot of country-specific criteria? thanks for your feedback! With regards to your question: in fact, there is not much else in terms of acceptance criteria. We allow companies of any size, i.e. 1 employee or more, to join Open Ecosystem – Build. We would like to see proof of the company being a ‘real’ company, so that’s why we check the office address and the website. For certain countries, a VAT or TAX ID number needs to be provided; a DUNS number will help us validate whether the company is legit. Thanks for this. Ok, that makes sense.